The man who gets the most glory for creating and co-creating Marvel Comics super-hero icons will have a cameo in an upcoming Activision game. 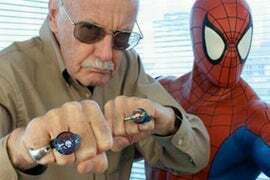 No word if his voice-over work includes the word "Excelsior." The 86-year-old "publisher emeritus" of Marvel Comics and co-creator of Spider-Man, The Fantastic Four and X-Men will appear as an as-yet unknown supporting character in this fall's Marvel: Ultimate Alliance 2. Lee is doing voice-work for the character. "I am thrilled to be making my first onscreen videogame cameo in Marvel: Ultimate Alliance 2," Lee was quoted as saying in an Activision press release that lacked Lee's standard verbal verve. Maybe this is how he really talks? "It's such a kick to see characters that I've helped create come to life in the game and now I'm a part of the Marvel videogame universe!" Activision reports that this is Lee's first appearance in a video game. The cultural icon has made numerous cameos in movies, including the recent Spider-Man films. No word from Activision as to whether Lee will be an unlockable, playable character.